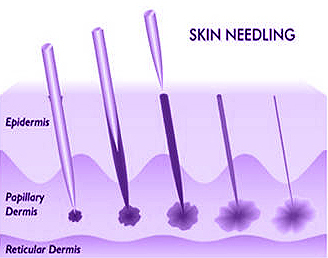 How does Skin Needling work ? Home / Diane Nivern Treatments / How does Skin Needling work ? How does dermaroller / dermastamp skin needling work ? The dermaroller or dermastamp is passed across the skin causing a numerous micro-punctures to the layers of the skin, these stimulate the body to produce its own collagen. Clinical studies show that there is a 400% increase in the production of healthy, elastic classes of collagen. The eventual process results in tighter skin, less lines and wrinkles with a softening and reduction in scarring. The skin also becomes thicker. Mainly used on the face, this procedure can be carried out anywhere on the body, such as on stretch marks, surgical or traumatic scars and is effective on all skin types. A home use dermaroller – short needles – can be beneficial for several months following “in clinic” treatments in conjunction with an appropriate skincare regime to both promote and maintain rejuvenation results. The needles on our medical rollers used for our “in-clinic” treatments reach the papillary dermal layer of the skin. This is where both elastin and collagen fibres are to be found (see illustration). Cosmetic rollers (used for home use), however, only penetrate to a low level in the skin (epidermis) where they assist in the absorbing of topical ingredients. As soon as the skin heals, these tiny punctures close up and become invisible very quickly. Skin preparation the application of vitamin A and C creams may be recommended for up to 4 weeks prior to the start of the treatments. Treatment sessions with medical grade rollers take between 10 – 20 minutes depending on the size of the area being treated. Pain should be minimal due to the application of the numbing cream ; however you may still feel some discomfort. The skin will be pink or red in appearance following treatment, with some minor bleeding and bruising possible, depending on the length of needle used for your treatment. It can take between 4 – 8 weeks before visible signs of skin regeneration are seen and the process will continue over the following months, with a gradual improvement. Even after a single treatment there can be a noticeable improvement, but we recommend a programme of two to five treatments even spaced over a period six to eight weeks in order to achieve the most optimal results. The specific number of sessions required will depend on the area being treated and the severity of the problem, as well as the level of natural response from the individual’s body.